Comic Relief celebrates over 20 years of raising money (over $55 million dollars to date!) 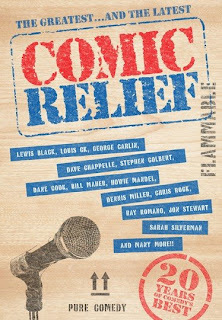 to combat homelessness as well as national disaster relief (Hurricanes Andrew and Katrina) with a 2 DVD set which features some of comedy's greatest talents--past and present. The first DVD starts off with a through-the-years retrospective featuring hosts Robin Williams, Billy Crystal and Whoopi Goldberg. Interesting to watch the former "young turks" as they aged over the span of two decades. Time marches on for all of us, eh? Clips from sets of well-known talent such as Drew Carey, Jim Carrey, Dana Carvey, Bill Maher, Dennis Miller, Bob Saget, Garry Shandling, Roseanne Barr and Stephen Wright provide highlights from various Comic Relief shows over the years. Like any comic's set, the clips are hit-or-miss. But there's such an amazing range of styles and talent, you're likely to find something and someone to make you laugh. The second DVD contains the 2006 Comic Relief show which helped raise funds for Hurricane Katrina victims and animal rescue operations. Sadly, a year after the terrible devastation caused by the storm, New Orleans remained a shambles. The lack of federal aid and accountability was often cited throughout the show--as was the outcome of the '06 elections, which sadly have not inspired the current administration to remember for whom they work. Oh well--that will change soon enough...The DVD also boasts special features devoted to telling the story of Katrina's victims as they still cope with the aftermath. A touching tribute by Billy Crystal wraps it all up as he invokes the passion, spirit and jazz of the struggling city. With over 4 hours of material on Comic Relief: The Greatest...and the Latest (yup, I watched almost ALL of it! ), you're guaranteed several chuckles, a guffaw or two and at least one bellylaugh. You'll see Richard Lewis doing his usual neurotic shtick, the sardonic and sarcastic Dennis Miller, Jon Lovitz's liar and a surprisingly hysterical Shelley Long (who knew?) riffing off straight man Woody Harrelson. Add to that guest appearances by the cast of Entourage and Star Trek: The Next Generation and you have an eclectic mash-up of comedic material to keep you entertain for hours. Whereas Comic Relief HAS raised money over the years to benefit healthcare for homeless people, the president of the company, Bob Zmuda is a total sleeze. The vice president of the company, Dennis Albaugh was the real deal, but he died of cancer a few years ago. The last show raised over 4 million dollars for Katrina victims yet lest than one million has been distributed over two years later. Zmuda just draws a big salary living off the interest.